Need an overnight solution? 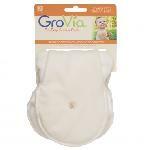 Looking to add on to your current reusable diapering system as an answer for your little heavy wetter? Accessorize with a Thirsties Hemp Insert for the very best in bulletproof protection against leaks. The steady and stable absorption characteristics of hemp works best behind the fast absorbing power of the microfiber terry soaker of Thirsties Fab Fitteds and Duo Diaper. Our experience has proven that the a combination of microfiber terry and hemp provides the very best absorption capabilities with the least amount of bulk. 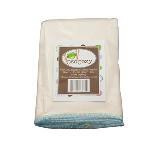 Thirsties Hemp Inserts add a tremendous amount of additional absorption capabilities to your existing cloth diapering system yet adds only the thickness of two stacked nickels! Made from 6 layers of remarkably soft hemp & cotton blend knit jersey, you will find that these are exactly what your baby needs to sleep comfortably through the night without leaks.